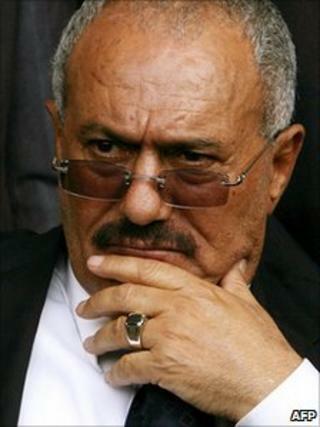 Yemen crisis: One-way ticket for Saleh? For 33 years, the Yemeni leader Ali Abdullah Saleh has been the great survivor. But everything suggests that his visit to Saudi Arabia for medical treatment will be a one-way trip. President Saleh has gone to Saudi Arabia after being injured in a rocket attack on a mosque inside the presidential compound on Friday. It appears the injuries are not life-threatening - sources in Saudi Arabia said he walked off the plane although wounds to his head, face and neck were clearly visible. However, members of his family, including his wife, have travelled with him. In fact he is reported to be accompanied by 35 relatives, as well as the prime minister and the Speaker of the Yemeni parliament. Back in the Yemeni capital Sanaa, the US ambassador has met the vice-president in what will be seen as support for the handover of power. Even if President Saleh wanted to return to Yemen, it is unlikely the Saudis would let him. Quite possibly they have engineered this medical trip as a face-saving way to get him out of power. So it appears that President Saleh will be the third leader swept away in what has become known as the Arab Spring, following President Ben Ali of Tunisia and Hosni Mubarak of Egypt. It was a series of popular protests - often violently suppressed - that loosened the Yemeni leader's hold on power. For a time the US stood by President Saleh. They saw him as a useful ally in the war on terror, helping to control the al-Qaeda presence in his country. Saudi Arabia was also ambivalent, the government nervous at the tide of revolutions sweeping the region. But President Saleh antagonised his allies, or former allies, by repeatedly offering to sign a deal to hand over power and then backing out at the last minute. On the most recent occasion, two weeks ago, he is suspected of sending his thugs to encircle the embassy containing the diplomatic delegation and to intimidate them. Since then, President Saleh has been involved in a more conventional military battle with supporters of the tribal leader Sadeq al-Ahmar. The opposition believe it is a fight deliberately picked by President Saleh, as part of a high-risk strategy to provoke civil war, and he is suffering the consequences. As so often in Yemen, the situation is now complicated - and dangerous. President Saleh has left behind his eldest son, Ahmed, and other nephews who are key military leaders. They could either enable a peaceful transition or lead a last-ditch resistance. Ahmed leads the elite republican guard. Nephews Ammar and Yahia also hold important positions in the security apparatus. The omens are not good. A ceasefire brokered by Saudi Arabia on Saturday seems already to have broken down and there are reports of fighting in Sanaa and Yemen's second city, Taiz. Members of the al-Ahmar family may believe their time has come to take control. Sadeq al-Ahmar leads the most powerful tribal grouping in this heavily tribal society. He is also one of the richest businessmen in Yemen. Another key figure will be General Ali Mohsen. He is one of a number of military leaders who defected to the opposition in the middle of March, and since then has helped protect their protests. In recent days he has not been heard from. At the very least, he has his own interests to look after and may feel he deserves a share in power. There is also the question of the role of Saudi Arabia, which has been a key player for years in Yemeni politics and whose support is vital to prevent the Yemeni economy from finally collapsing. So the crowds of protesters who have come out to cheer President Saleh's departure will be well aware that much still stands in the way to the emergence of a full democracy. Whoever eventually comes to rule Yemen faces daunting problems, ranging from security to the economy, and a desperate shortage of water for the growing population. Yemen's troubles may only just be starting.